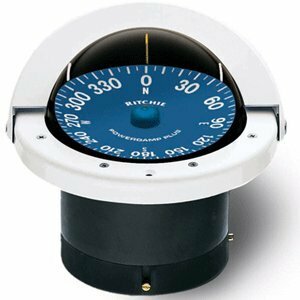 The Super sport flush mount compass from Richie Navigation is developed for and tested on offshore race boats. It features a 4 1/2" Power Damp Plus, high-visibility blue dial with extra-large white numerals and 12V green LED lighting in a movable sun shield. The Super sport includes compensators to easily adjust for deviation, Internal gimbal systems for maximum stability during adverse pitch and roll conditions and 45-degree lubber lines. 5-year warranty. Black.